Headlines about the UK continuing to set clean-energy records have been abundant this year. The UK PV market has been particularly resilient during the past few years despite the reduction of feed-in tariff (FiT). A large part of this is due to the dedication of solar installers committed to growing the market. One of the ways that PV installers continue to reinvigorate the market is through selling upgrades of PV systems. This has created a very competitive market in which there have been concerns regarding mi-selling. Since this is a key sales area for PV installers, we would like to provide a few sales tools and best practices that installers can adopt, while also doing our part to protect the integrity of the industry. There are many different ways that PV system owners can benefit from upgrading their PV system. The first step is identifying how an upgrade might be of interest to a specific system owner and then to sell to that point. One of the most common reasons to upgrade is an inverter failure or system issue. If a PV system is experiencing some type of failure or underperformance, this could serve as an excellent opportunity for a system owner to consider an upgrade to a new inverter, especially one with MLPE technology. If there is an inverter failure or system issue, it is important to visually check the entire installation for physical or other damage to try and identify the source. Following this inspection, it is also key to check the inverter's uptime, the warranty, and leverage the current monitoring system (if present) to identify underperformance. Another reason for a homeowner to upgrade is to extend system functionality. Previous inverter generations tend to have limited functionality. System owners may be interested in adding storage or smart energy management to their PV system for increased self-consumption and energy independence. Other functionality that standard string inverters do not offer is module-level monitoring. If a system owner is interested in high-resolution monitoring, this is an opportunity to recommend an upgrade to an inverter with MLPE technology. Specifically, if there have been system production issues, especially module issues, the homeowner may enjoy a test drive of a monitoring platform that offers module-level insights. In the event that the system owner is interested in expanded system functionality, installers can review the different ways that functionality can be added, such as battery storage and a variety of home energy management devices. Simply installing an Energy Meter with Modbus Connection as part of the inverter upgrade can give a homeowner even more visibility into their PV system. The meter can act as a gateway for adding storage or smart energy management in the future. By providing insight into energy production versus consumption, the meter acts as a sales tool for showing how a homeowner can benefit from increasing self-consumption. With recent headlines about fires in buildings that had PV systems installed, homeowners may be interested in enhancing their PV system's safety. Explaining that PV systems are generally safe, while clarifying that there are also new advances, such as arc detection and module-level shutdown, that have made them even safer, can create a potential sales opportunity. In this case, it is important not to use fear tactics. When, or if, a system owner asks about enhancing safety of the PV system, it is important to explain the evolution of safety standards, describe the varying standards around the world, and detail the different safety functionalities that new systems offer. Some system owners may simply be disappointed in their system's production and are looking to increase their FiT revenue. By upgrading to a new inverter with increased weighted efficiency, a homeowner will potentially realise an increase in solar energy production, which in turn will increase the homeowner's FiT revenue. 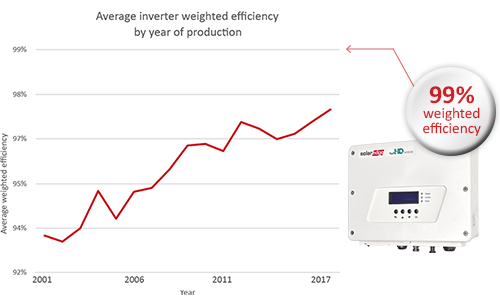 The average inverter efficiency has significantly increased during the past years, from about 93% to now around 97%, with the highest now reaching 99%. This increase in efficiency means system owners get more energy out of their system and more FiT revenue. Another way for system owners to increase FiT revenue is by eliminating module-level mismatch. Explaining how mismatch can reduce system production could create interest in a system upgrade. Adding power optimisers to a system upgrade can provide an increase in system production due to module-level power optimisation. When explaining the concept of increased energy production, it is important to set reasonable expectations and clarify that each PV system's increased energy production will be dependent on the specific system characteristics and that not every system will have the same results. Increasing FiT revenue might be one of the most attractive reasons for a system owner to upgrade. If this point is of interest to the homeowner, then it may help if you run a simulation of the added energy that could be expected to their system in order to create realistic expectations with regard to additional energy. Even a small increase in energy yield of 7% could represent a significant increase for the homeowner's bottom line. As an example, if a homeowner had a 4kWp standard PV system installed in 2011, even a conservative increase of 7% in annual energy production following an upgrade to a SolarEdge system, would mean that the homeowner's annual yield would increase from 850kWh/kWp to 909.5kWh/kWp. This would mean, under the same tariff rate, an increase of £141 per year. While there may be some market uncertainty in the UK, there is still plenty of value within the retrofit market for homeowners and opportunities for installers to help sustain the residential PV market when best practices are implemented.